Located 4km from the Wild Atlantic Way route, along the main Buncrana to Clonmany Road the Glendowen Craft Shop at Meentagh Glen is an easy place to find and the location itself is very scenic. A large sign leads the visitor to the property where you are greeted by two traditional style stone buildings. The sense of tradition and of being off the beaten track is reinforced by the sheep you can see grazing at the back of the property. Welcomed by a quirky, half open Dutch door and vibrant window display I enter the shop where I receive a warm welcome from Ann McGonigle, pictured above, owner and crafter at Glendowen. Items on display range from jewellery, stylish wraps, and hats of all colours, perfume, beautiful wall hangings, books and paintings. How did this hub of Craft and Art in Inishowen come about? For Anne “A love and knowledge of craft was harbored from a young age”. Having suffered from Asthma as a child, Ann spent much time at home. To prevent boredom, her late mother, a talented crafter, began to encourage her daughter from the age of 6 to sew and crochet. Over the years Ann’s work with tweed, wool and other materials intensified. In 1997 Glendowen was established and work began out of the current studio in 2004. 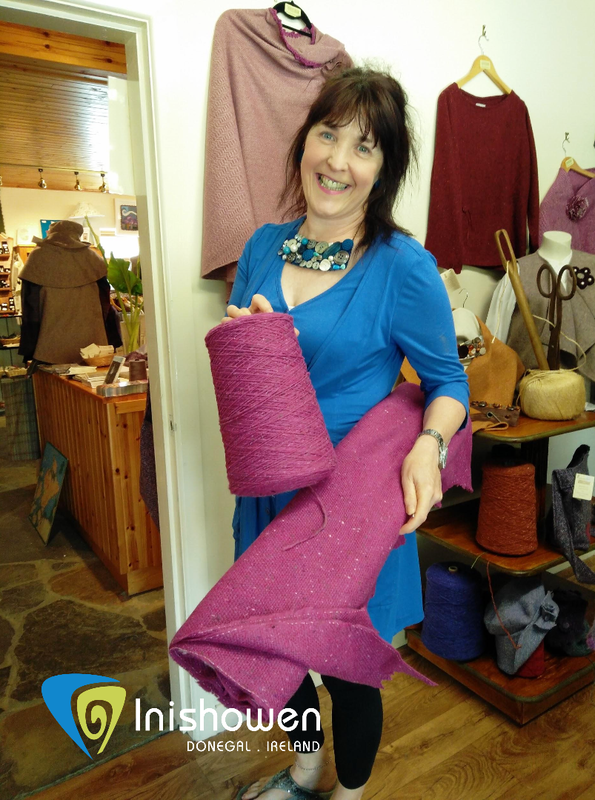 Inspiration for her work, stems from traditions passed down through the generations, from the stunning landscape that surrounds the craft shop, the wider Inishowen Peninsula and a little from the “style magazines read every Sunday morning”. Ann was always “Mad about Donegal Tweed & Knitwear” and wanted to find a way to combine both materials, which was skillfully achieved, starting with jackets and tunics. Ann would later specialise in a range of ladies’ garments with a hand-crochet finish including some of the coats, wraps, hats, scarves, bags and jewellery seen above. A passion and attention to detail can be seen in each item. On display are many unique & quirky items inspired by requests made by friends and visitors. Products range from button earrings covered in tweed and wool, dicky bows, pictured above, made from tweed and a selection of bandanas and bow ties for pets, which are ridiculously cute. Other gift style purchases are tweed & wool based book covers, wine holders and a personal favourite; small sacks of turf. Each sack, pictured above, is made from tweed with a unique badge attached to the front. Inside you find tiny hand cut pieces of turf. How did this come about you might ask? By listening to visitors Ann found they loved Irish turf. What better way to pack this in your suitcase than with this perfect little gift. Initially, many visitors came to the shop, and questioned where to get other craft items which led Ann to the decision to showcase the work of other crafters/artists at Glendowen. 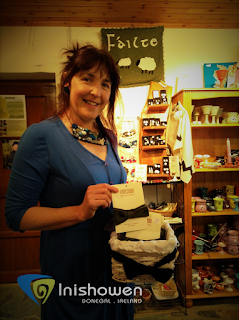 The shop now sells stunning pieces from Moville Pottery, Ballagh Studio and Crana Knits. Solidarity soon grew amongst creative groups in the area, resulting in a booklet that provides a guide of where to view and purchase art & craft products in Inishowen. 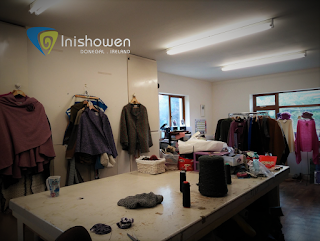 Over 70% of the items in the shop are sourced and made from local/Irish materials, for example Donegal Tweed and Yarn used in Ann’s range of garments and jewellery is sourced from Magee’s of Donegal Town and McNutt’s of Downings, Donegal. Located in a room off the main shop display is a workshop, pictured above, where Ann has ample space to create her line of craft items. How often do we get the opportunity to know and see where our clothing is made and talk to the person that makes it? 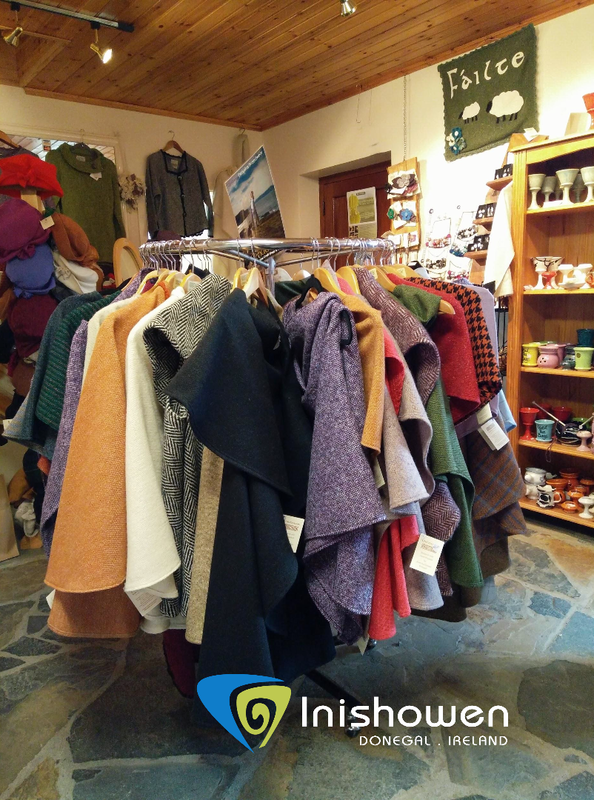 Each purchase is unique, skillfully made on location from the finest local materials. 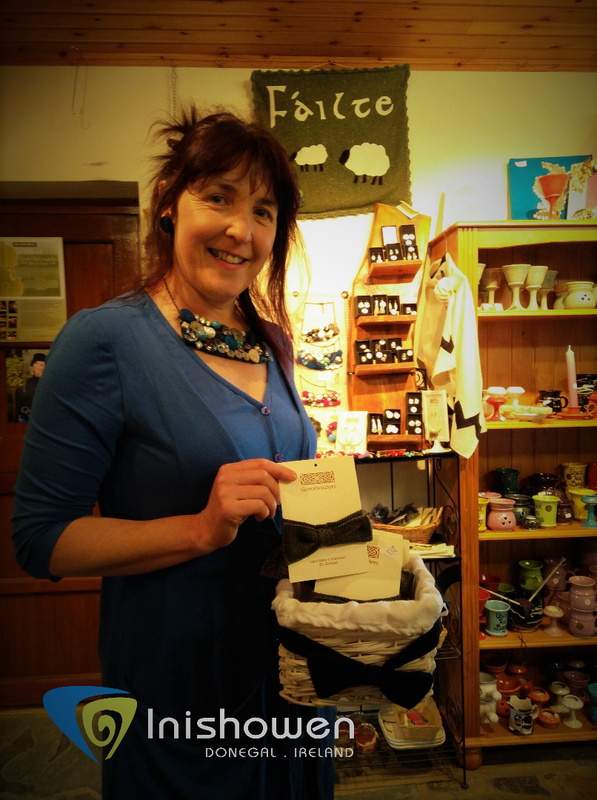 Every product in the shop promotes local/Irish craft and the traditional skills that have been passed down from generation to generation. Ann’s engagement and focus on ensuring each “visitor goes out the door with a feel good factor” enhances an already memorable experience. 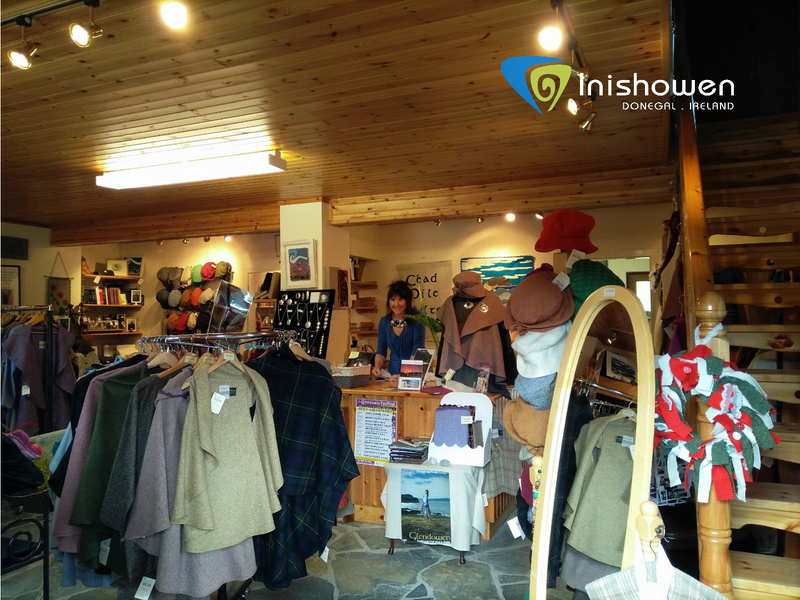 Glendowen is a place for local and visitor alike to visit and experience. Opening hours are from 10.30 – 5.30, Monday to Saturday or any other time by appointment. Only a small percentage of Ann’s range is available in other shops, so if you want to buy any of what you see above make sure to call into the shop! 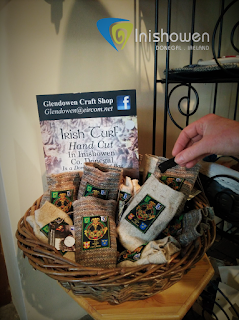 Add any comments/questions about the article below and stay tuned for part two of my next visit to the Glendowen craft shop where I learn about the popular traditional music sessions that take place at Glendowen.